First responders rushed to the aid of trapped and injured shoppers in downtown Philadelphia last month, after a botched demolition project, without a second thought to their own safety. Now, however, our Boston mesothelioma lawyers understand that in those hours spent digging, climbing, pulling and lifting, brave men and women were exposed to asbestos fibers, lingering in the air after the collapse. 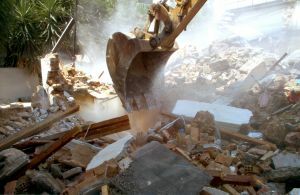 The revelation that a licensed asbestos inspector had deemed the structure asbestos-free just days before the incident. Let’s start with the general risk to first responders. We tend to think of asbestos exposure as being something that is primarily an issue for industrial workers – those in fields of construction, mechanics, shipping, electrical engineering, etc. And it’s true that all of those are high-risk occupations in terms of asbestos exposure. However, firefighters are often at risk just by virtue of the fact that their headquarters often contain asbestos. During downtime, firefighters often will do improvement projects here and there around the station, heightening their risk of exposure. Additionally, given the pervasiveness of asbestos in many 20th century buildings and the fact that the substance is especially deadly when disturbed, consider who we send to these structures when they are on fire or collapsing. Even those who might not have been on a call to an asbestos-laden structure might be exposed to it from the unwashed gear hanging up from those who were on the scene. And the issue of gear is our second point. We recognize that firefighters and all first responders are trained to get their quickly and rush into dangerous situations where everyone else is trying to get out. But there is no reason whatsoever that these brave men and women should not be appropriately equipped with gear that will protect them in the event they encounter asbestos that has been disturbed. Even in this case where there may have been bad information regarding the supposed lack of asbestos at the site, supervisors should treat every scene as if it has that potential – especially in older cities like Philadelphia and Boston, where it’s very likely to be the case. Which brings us to the last point, which is the reported failure of this asbestos inspector to correctly identify whether the fibers were present in this structure. This inspector, certified by the city, two weeks prior to the collapse submitted an inspection report indicating that no asbestos was found at the site. Six people were killed when demolition crews improperly took down a wall of the structure. Subsequently, crews were brought in to remove the debris. Those crews have since confirmed that asbestos did in fact have to be removed from the site, proving it was present after all. A councilman is now demanding a full-scale investigation, and was quoted by a local newspaper as saying that it appears as if “the asbestos report to the Health Department isn’t worth the paper it was written on.” He went on to say that the police, firefighters and others who dove into the debris to make those harrowing rescues deserve answers. So far, the mayor’s office has refused to answer questions about how a city inspector could have been so wrong. No doubt, this is not an issue the people of Philadelphia will be willing to drop anytime soon.